Passing soccer drill for U9's! Passing Soccer Drill - 3v4v3! This passing soccer drill is loved by young players because it allows for lots of goal scoring opportunities in a game situation. This isn't your standard 6v6 game, this allows players to understand positions on the field. Take a look at the diagram below. You will notice there are 6 players from each side including a goalkeeper for each team. You will need two goals either end and short cones to divide the pitch in to three sections (see orange cones below). You will need at least one soccer ball and pinnies to seperate the players. As mentioned above, this soccer passing drill is to focus on players passing the ball correctly and also allowing players to have lots of shots on goal. The game is called 3v4v3 because that's how the pitch is divided and you don't have to have goalkeepers if you don't want. The idea of the game is for the players to pass the ball to the attacking players on their team to allow them to shoot. Players must remain in their coned off areas meaning four players must stay in the middle and two attacking players stay one end and one defender for each side the other end. The attacking players for each team will outnumber the single defender for each team. This is to allow lots of shots on goal. The reason the players are separated is to avoid them bunching up in one section of the field, this way the players have to stay as either an attacker, defender or midfielder. Defenders have to pass to midfield and cannot pass straight up to the attacking player. After a while, change the players position to allow everyone to be an attacker or defender etc. This game can be easily turned in to 4v4v4 to make it harder for your attacking players.Defenders should try their hardest not to allow any shots on goal. You can also introduce a second soccer ball to speed the game up if your players are getting the hang of the game. 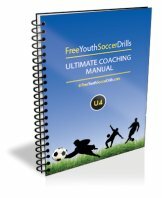 To leave this Passing Soccer Drill - Click Here!